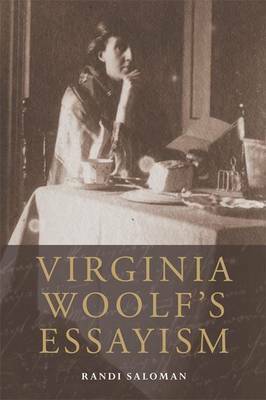 This book explores the way Woolf used essay-writing techniques to develop her conception of the modern novel. The focus of this study is on Virginia Woolf's vast output of essays and their relation to her fiction. Randi Saloman shows that it was by employing tools and methods drawn from the essay genre - such as fragmentation, stream-of-consciousness and dialogic engagement with the reader - that Woolf managed to leave behind the realism of the 19th-century novel. Saloman draws on key theorists of the essay such as T.W. Adorno and Georg Lukacs, as well as on more recent scholars of 'essayism' (a term devised by Robert Musil to describe the hypothetical quality of the essay mode). She shows that the essay, as genre and mode, shaped Woolf's writing, and modern fiction more generally, in ways that have not yet been articulated. It offers in-depth consideration of Virginia Woolf's shorter essays. It includes revisionary accounts of A Room of One's Own (1929) and Three Guineas (1938), and new readings of Woolf's major and less well-known novels, including The Pargiters, her failed 'essay-novel'. It repositions the essay as a major modernist genre, responsible in large part for the creation of the modern (and especially the 'modernist') novel. Virginia Woolf's Essayism is a provocative yet compelling work of advocacy for the importance of essay writing to histories of literary modernism, and it performs the revitalizing work of looking anew at Woolf's oeuvre, recovering forgotten battlegrounds for textual experiment and innovation.